The MickeyDelp.com Bender Sequencer can turn any device that makes sounds into a rhythm or melody machine by playing a sequence of notes. The Bender Sequencer was created specifically for controlling devices that were never even designed to be controlled! Those devices can be electronic musical instruments, circuit bent toys, electronic kits or your own circuits. The Bender Sequencer has a variable resistor output that can be connected to a circuit the same way you would connect a potentiometer, and a trigger output that can be connected anywhere you would connect a switch or pushbutton. If you have a modular synthesizer with a CV (control voltage) or MIDI input, then there are plenty of commercial sequencers and several sequencer kits available. However, if you have a device that has no built-in control interface, then you need the Bender Sequencer. Any noise making circuit that has a pitch resistor can now play sequences of notes. That's what the Bender Sequencer was created for! Select 2, 3, 4 or 8 steps in the sequence. An LED for each step and one for the trigger make a cool display. Wirelessly link multiple sequencers to control multiple devices with a synchronized beat. Easily switch between sixteenth, eight, quarter or half notes. Synchronized sequencers can run at the same base frequency with different divider settings. An optoisolator is a device that contains an LED and a light-activated transistor embedded inside it. The sequencer turns on the LED, which activates the transistor. This has the effect of electrically isolating the sequencer from the bent device. The benefit of optoisolation is that no voltage runs through the outputs so the bent device can run at a different voltage than the sequencer without affecting either device. To get a better understanding of how to use the Bender Sequencer, read this how-to article for detailed instructions on connecting the Bender Sequencer to the Gakken SX-150 and Korg Monotron mini synthesizers. Atari Punk Console, Weird Sound Generator, and more! Here is a more detailed video of the sequencer controlling a circuit bend bird song calendar. The sequencer part starts at 3:30. Here is a video of the sequencer controlling a circuit bent Saw III memo recorder. The sequencer part starts at 0:55. Running through Wooster Audio's Space Baby, with a Bleep Labs Nebulophone thrown in for good measure. The output is passed through a Tone2 FilterBank VST for some very cool sounds. I pity the fool who doesn't like this video! By the way, the Bender Sequencer can control the tempo of the Nebulaphone through IR Sync, but it cannot bend the pitch because the Nebulaphone is digital. I have talked to Dr. Bleep about it and he agrees. Contact Me and we will post links to your Bender Sequencer videos and pictures here! Instructions refer to the below picture. Click on the picture for a full-sized, non-annotated version. A Trigger Terminals - These two screw terminals connect the trigger output to the bent device. Insert wires into the terminals and tighten the screws. Then connect the wires to the bent device. The trigger can be used just as you would use a switch. Each step of the sequence, the trigger switch goes on, then off. The trigger output can be used in many ways. For instance the trigger could be connected across a button of the bent device to simulate pressing the button, or it could be used to connect two glitch points, or it could be used in series with a resistor to produce a vibrato or tremolo effect. The trigger can be used alone, in conjunction with the resistor output, or not at all. B Resistor Terminals - These two screw terminals connect the resistor output to the bent device. Insert wires into the terminals and tighten the screws. Then connect the wires to the bent device. The resistor output is used just as you would use a resistor or potentiometer. Each step of the sequence, the associated step potentiometer is connected to the resistor terminals. The resistor output is typically used to control the pitch of a bent device. The resistor output can be used alone, in conjunction with the trigger, or not at all if you want only the trigger function. C Trigger Indicator LED - The trigger indicator LED blinks once for each beat. When it is on, it indicates that the trigger output is on. D Step Indicator LEDs - One step indicator LED will be lit at a time, indicating the current step. E Step Potentiometers - These are the knobs that control the resistor output of each step. F Power Switch - This is a three-position slide switch that turns the sequencer off, or sets lead or follow mode. See IR Sync below. G Duration - The duration potentiometer controls the amount of time that the trigger output is on during each step. When the frequency divider switch is set to 1, the duration is fixed at 50% of the step time. H Frequency - The frequency potentiometer controls the speed of the steps. The frequency is equivalent to beats per minute. I Frequency Divider Switch - The frequency divider is a four-position switch that divides the frequency by 1, 2, 4 or 8. If you think of one beat as a 16th note, then the frequency divider settings change the notes to eighth, quarter or half notes, respectively. It is primarily used when multiple devices are connected with IR Sync. J Steps Switch - This four-position switch sets the number of steps in the sequence. The options are 2, 3, 4 or 8 steps. IR Sync is used to wirelessly connect multiple devices so that they run in synchronization at the same frequency. The devices can be Bender Squencers, or any of the Andromeda Space Rockers made by EricArcher.net (who invented the IR Sync method). It also works with the Wooster Audio MIDI-IR controller. The devices are set side-by-side. Each device’s infrared LED points to the next device’s infrared detector. The first device on the left is set to lead and all the devices to its right are set to follow. The lead device controls the frequency. On every beat, the leader pulses its infrared LED. Each device down the line detects the infrared signal, acts on it, and pulses its own infrared LED. This is where the Bender Sequencer’s frequency divider comes in. Two or more sequencers can be synchronized, but each one can be playing different note lengths. For instance, one sequencer can be playing 16th notes and another playing eighth notes. So the second sequencer will advance one step for every two steps of the first one. Each device pulses its infrared LED on every 16th note, regardless of its frequency divider setting. Part numbers in this document refer to the Bender Sequencer schematic. The heart of the circuit is the CD4022 octal counter chip (U2). It is the little brother of the better-known CD4017 decade counter. The 4022 pulls one of eight outputs high on each clock pulse. Each output is connected to two LEDs. One is a visible step indicator LED (D1-D8), the other is the LED inside of the LTV845 quad optocouplers (U3 and U4). The transistor inside the optocoupler switches on and connects the associated potentiometer (VR1-VR8) to the terminals. So, on each clock pulse one of the eight potentiometers is connected to the device attached to the terminals. 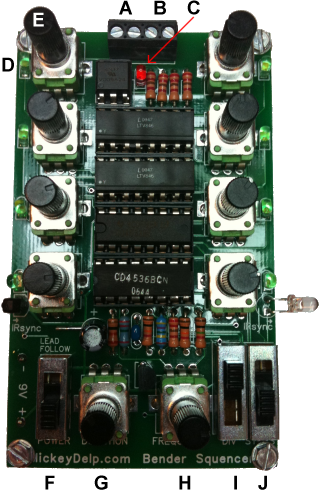 The clock pulses are generated by the CD4536 programmable timer chip (U1). The 4536 is great because it has a clock and frequency divider in one chip. It can also be clocked externally. The power/lead/follow switch (S1) selects the internal clock or the SFH5140 infrared Schmitt-Trigger (Q1). In follow mode, an infrared pulse (from another sequencer or other device) sets the clock frequency. The divider switch (S2) sets the frequency division to 1, 2, 4 or 8. That lets several IR-synchronized devices generate sixteenth, eighth, quarter or half notes individually based on the same sixteenth note clock. In lead mode, the frequency is set by potentiometer VR8. Potentiometer VR9 sets the duty cycle, that is, the amount of time the trigger output is turned on during each clock pulse. Each clock pulse is sent through a switching transistor (Q2) to three places. First is the 4022 as described above. Second is an infrared LED (D9) to synchronize with the next device. Third is the 4N37 optocoupler chip (U5), the output of which is connected to the trigger terminals.